This article is about the 2012 song. For the 2019 song featuring Ora, see R.I.P. (Sofía Reyes song). (2012) "Drinking from the Bottle"
"R.I.P." is a song recorded by British singer Rita Ora from her studio album, Ora, featuring British rapper Tinie Tempah. The song was released as the lead single from the album in the United Kingdom on 6 May 2012. "R.I.P" is an R&B and dubstep influenced song, sampling the Chase & Status remix of the Nneka song "Heartbeat". It is also a cover of Drake's song, "I'm Ready for You", from his 2010 The Gift Without a Curse mixtape. "R.I.P." was the UK lead single from Ora's album, as well as her second solo single since being signed to Roc Nation. The song was written by Canadian artist Drake, and originally intended for Rihanna. There is a remix of the song that actually features Drake singing and rapping along with Ora. The song was also co-written by Farhad Samadzada, Mikkel S. Eriksen, Tor Erik Hermansen, Nneka Egbuna, Renee Wisdom, Saul Milton, William Kennard. She also felt releasing it as her first UK solo single would be a good career move: "As a new artist wanting to make a statement, I definitely felt a confidence-boost would be the way forward. Which is why, as soon as I heard 'R.I.P. ', I loved the message behind it." The song was co-produced by English duo Chase & Status and Stargate. It was later revealed that the rapper Tinie Tempah would feature on the track titled "R.I.P." In an interview Ora spoke on why she choose to have Tinie Tempah on the album: "Having Tinie on there and working with him is so great because I'm from the UK, I listen to UK music and I really wanted him to be a part of it. His flow just killed it on the beat". The song samples Chase & Status' remix of Nigerian singer Nneka's 2008 hit "Heartbeat". The song was released through digital download to Ireland on 4 May 2012 and to the United Kingdom on 6 May 2012, and was also sent to mainstream radio's in the United States on 25, April 2012. Ora described the single as "a synthy, dubstep-flavoured banger." Digital Spy gave the song three out of five stars saying that Ora "still has a considerable way to go before she reaches RiRi's level of icy command on such a track. "R.I.P." debuted at number one on the UK Singles Chart with sales of 104,592 and became the seventh fastest selling single of 2012 in one single week behind Carly Rae Jepsen, Tulisa, DJ Fresh and herself, Maroon 5 and Wiz Khalifa, Gary Barlow and Cheryl Cole. The song remained at number one in the UK for two weeks but only one week in Scotland. The song has sold 453,000 copies in the UK in 2012, and was the 28th best-selling single of the year. The video for the single was shot in Hackney, East London. The video was uploaded on to Ora's official VEVO on 4 April 2012. The video was directed by Emil Nava. Ora released a 36-second teaser of the video and uploaded it to her official VEVO on 2 April 2012. She also released behind the scenes footage of her and Tinie Tempah onto the internet. Tinie Tempah was featured on the single and in the video. Rap-Up described the video saying "flaunts her drop-dead gorgeous looks, impeccable swag, and beanie collection as she dances on top of customized cars in a grungy warehouse. Her British pal Tinie Tempah injects some attitude, while Rita bites the bullet—literally—in the in-your-face clip". PopCrush noted that "Tinie Tempah shows up for the first few moments, then steps aside for the most part in order to let Rita do her thing. However, their scenes together crackle!" MTV reviewed the video saying "Not much goes on in the 'R.I.P.' video except for tons of vanity shots of Rita looking exceptionally hot (...) Sure, a plotline in a music video is always a good idea, but when you've got a scorching record and two extremely attractive people in the same room, there's really not much else to do except to watch them be hot". Idolator gave the video a very negative review saying "this is ridiculous. In the video for her single 'R.I.P. ', British singer Rita Ora comes off like a second-hand Rihanna, from her wardrobe to the Talk That Talk-cribbing song itself". ^ Stephen Clark - Design. "Rita Ora: Incredible Ora". bluesandsoul.com. ^ Drake talks next album Rita Ora and getting 'Punkd'D'. rap-up.com. 29 March 2012. ^ Rita Ora Talks Rihanna Comparisons, R.I.P, Roc Nation and Beyonce. YouTube. ^ Tim Jonze (12 April 2012). "Rita Ora: 'Jay-Z thinks I could be as big as Rihanna' | Music". London: The Guardian. Retrieved 12 May 2012. ^ New Song: Rita Ora Featuring Tinie Tempah, 'R.I.P.'. MTV News. 29 February 2012. ^ Just Signed - Rita Ora. Columbia Records. ^ "Rita Ora scores second Official Number 1 single of the year!". officialcharts.com. ^ "Official Chart Analysis: No.1 Keane album Strangeland sells 48k". Retrieved 20 May 2012. ^ Dan Lane (2 January 2013). "The Official Top 40 Biggest Selling Singles Of 2012 revealed!". Official Charts Company. Retrieved 5 January 2013. ^ Watch: Rita Ora Talks ‘RIP’ Video, Drake & Ex- Girlfriends. thatgrapejuice.net. 14 March 2012. ^ a b Rita Ora - R.I.P. ft. Tinie Tempah. VEVO/YouTube. 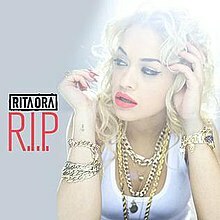 ^ Rita Ora - R.I.P. 30-Second Video Teaser ft. Tinie Tempah. YouTube. ^ Behind The Video: Rita Ora F/ Tinie Tempah – ‘R.I.P.’. rap-up.com. 29 March 2012. ^ RITA ORA featuring Tinie Tempah performing R.I.P. (Behind The Scenes). ^ Video: Rita Ora F/ Tinie Tempah – ‘R.I.P.’. rap-up.com. 4 April 2012. ^ Rita Ora Comes Alive In ‘R.I.P.’ Video Feat. Tinie Tempah. popcrush.com. ^ New Video: Rita Ora Featuring Tinie Tempah, 'R.I.P.'. buzzworthy.mtv.com. 4 April 2012. ^ Rita Ora "R.I.P." Video - Rihanna. idolator.com. ^ Rita Ora Performs "R.I.P." Live For 4Music's The Crush. singersroom.com. 9 April 2012. ^ Rita Ora Performs ‘R.I.P.’ At Drake’s ‘Club Paradise’ Tour. rap-up.com. 3 April 2012. ^ "Watch: Rita Ora Soars For Wired 96.5 (Acoustic Performance) | ..::That Grape Juice // ThatGrapeJuice.net::.. || Thirsty?". Thatgrapejuice.net. 18 April 2012. Retrieved 12 May 2012. ^ a b R.I.P. (feat. Tinie Tempah) - EP by Rita Ora - Preorder R.I.P. (feat. Tinie Tempah) - Download R.I.P. (feat. Tinie Tempah) - "EP on iTunes". iTunes Store. ^ "R.I.P. : Amazon.de: Musik". amazon.de. ^ "Details about RITA ORA featuring TINIE TEMPAH "R.I.P." ULTRA RARE 5-track promo CD - MINT". ebay.co.uk. ^ "Australian-charts.com – Rita Ora feat. Tinie Tempah – R.I.P.". ARIA Top 50 Singles. Retrieved 23 August 2015. ^ "Austriancharts.at – Rita Ora feat. Tinie Tempah – R.I.P." (in German). Ö3 Austria Top 40. Retrieved 23 August 2015. ^ "Ultratop.be – Rita Ora feat. Tinie Tempah – R.I.P." (in Dutch). Ultratop 50. Retrieved 23 August 2015. ^ "ČNS IFPI" (in Czech). Hitparáda – Radio Top 100 Oficiální. IFPI Czech Republic. Note: Change the chart to CZ – RADIO – TOP 100 and insert 201224 into search. Retrieved 23 August 2015. ^ "Danishcharts.com – Rita Ora feat. Tinie Tempah – R.I.P.". Tracklisten. Retrieved 23 August 2015. ^ "Offiziellecharts.de – Rita Ora feat. Tinie Tempah – R.I.P.". GfK Entertainment Charts. Retrieved 28 February 2019. ^ "Chart Track: Week 19, 2012". Irish Singles Chart. Retrieved 23 August 2015. ^ "Dutchcharts.nl – Rita Ora feat. Tinie Tempah – R.I.P." (in Dutch). Single Top 100. Retrieved 23 August 2015. ^ "Charts.nz – Rita Ora feat. Tinie Tempah – R.I.P.". Top 40 Singles. Retrieved 23 August 2015. ^ "Official Scottish Singles Sales Chart Top 100". Official Charts Company. Retrieved 23 August 2015. ^ "ČNS IFPI" (in Slovak). Hitparáda – Radio Top 100 Oficiálna. IFPI Czech Republic. Note: insert 201222 into search. Retrieved 23 August 2015. ^ "Swisscharts.com – Rita Ora feat. Tinie Tempah – R.I.P.". Swiss Singles Chart. Retrieved 23 August 2015. ^ "Official Singles Chart Top 100". Official Charts Company. Retrieved 23 August 2015. ^ "Rita Ora". Billboard.com. Retrieved 7 December 2017. ^ "Hot Dance Club Songs - Week of November 3, 2012". Billboard. Prometheus Global Media. 3 November 2012. ^ Lane, Dan (2 January 2013). "The Official Top 40 Biggest Selling Singles Of 2012 Revealed!". The Official Charts Company. Retrieved 2 January 2013. ^ "ARIA Charts – Accreditations – 2012 Singles". Australian Recording Industry Association. Retrieved 18 August 2013. ^ "Rita Ora Feat. Tinie Tempah "R.I.P." (SME)" (in Danish). IFPI Denmark. Retrieved 14 July 2014. ^ "British single certifications – Rita Ora Ft Tinie Tempah – R.I.P." British Phonographic Industry. Retrieved 3 August 2018. Select singles in the Format field. Select Platinum in the Certification field. Type R.I.P. in the "Search BPI Awards" field and then press Enter. ^ "iTunes - Music - R.I.P. (feat. Tinie Tempah) - EP by Rita Ora". Itunes.apple.com. 4 May 2012. Retrieved 12 May 2012. ^ "Top 40/M Future Releases - Mainstream Hit Songs Being Released and Their Release Dates ..." All Access. ^ "Top 40 Rhythmic Future Releases - R&B Song and Hip-Hop Music Release Dates - ..." All Access. "Turn the Music Louder (Rumble)"
"Someday (Place in the Sun)"
This page was last edited on 15 April 2019, at 06:27 (UTC).